Night myopia, which is a shift in refraction with light level, has been widely studied but still lacks a complete understanding. We used a new infrared open-view binocular Hartmann-Shack wave front sensor to quantify night myopia under monocular and natural binocular viewing conditions. Both eyes’ accommodative response, aberrations, pupil diameter, and convergence were simultaneously measured at light levels ranging from photopic to scotopic conditions to total darkness. 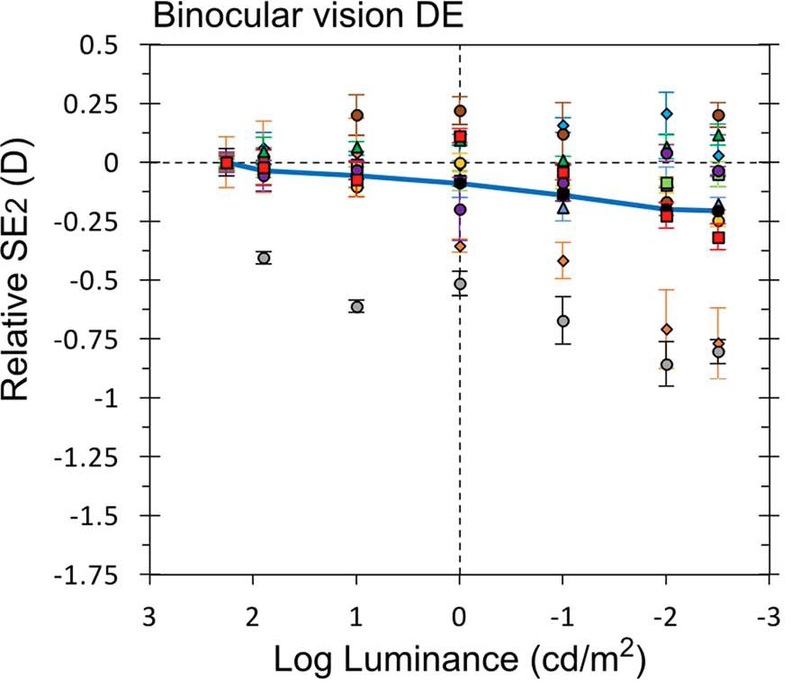 For monocular vision, reducing the stimulus luminance resulted in a progression of the accommodative state that tends toward the subject’s dark focus or tonic accommodation and a change in convergence following the induced accommodative error. Most subjects presented a myopic shift of accommodation that was mitigated in binocular vision. The impact of spherical aberration on the focus shift was relatively small. 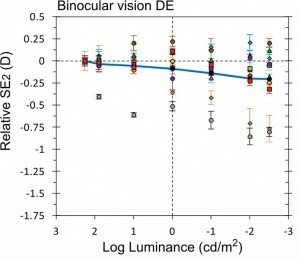 Our results in monocular conditions support the hypothesis that night myopia has an accommodative origin as the eye progressively changes its accommodation state with decreasing luminance toward its resting state in total darkness. On the other hand, binocularity restrains night myopia, possibly by using fusional convergence as an additional accommodative cue, thus reducing the potential impact of night myopia on vision at low light levels.